On Saturday, February 2nd a WPLL Select Team featuring 2018 WPLL Champions Bridget Bianco, Megan Douty, Tanner Guarino, Ela Hazar, Taylor Hensh, and Sarah Lloyd will face off against Brown University’s women’s lacrosse team. 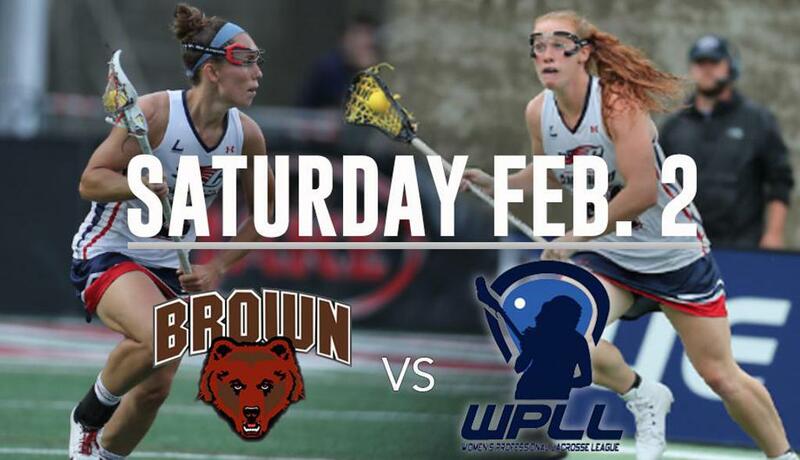 The game, which will be played at Brown’s Stevenson-Pincince Field at 1:00pm ET, will use WPLL rules. Saturday's game is open to the public and marks the first time that the WPLL will scrimmage against a college team. The WPLL Select Team, which also features 2x World Cup Champion Ally Carey, will face a talented Brown team. Brown finished the 2018 season at 9-6 overall and 2-5 in the competitive Ivy League Conference. All of Brown’s 2018 conference losses came by 3 goals or less. A young team, Brown returns their top five scorers from 2018. This talented batch of players includes sophomore Risa Mosenthal, who during the 2018 season led the Bears in points (64) and goals (55). Mosenthal’s 55 goal season was the second best all-time at Brown while her 64 points were third highest. Mosenthal received Second Team All-Ivy League honors along with junior attacker Emma DeGennaro (32G, 18A) and senior midfielder Carline Zaffino (32G, 10A). Brown also returns 2018 Honorable Mention All-Ivy League senior attacker/midfielder Hafsa Moinuddin who led the Bears in assists (20) in 2018. Sophomore attacker Maggie Fowler will look to improve on an impressive 2018 season where her 29 points (18G, 11A) made her Brown’s 5th leading scorer. Defensively the Bears return several key contributors including 2018 starting keeper Maggie Bigelow (40.1% save percentage, named Ivy League Defensive Player of the Week on 4/2/18) and defenders Emily Fryer (junior, 36 ground balls in 2018), Allison Lanzone (20 ground balls, 11 caused turnovers in 2018), and Olivia Lee (senior, 16 caused turnovers, 15 ground balls in 2018). Brown is led by Head Coach Keely McDonald, who has been at the Bear’s helm for 15 seasons. Liz Robertshaw will serve as the Head Coach of the WPLL Select Team. Robertshaw, who served as Assistant Coach at Brown from 2000-2003, is a 2x World Cup championship-winning coach with Team USA (2013, 2017). Robertshaw and the WPLL Select Team will be joined by Kathy Rudkin, Katrina Geiger, and Micheala Duranti, who will be playing in their first WPLL game. The WPLL is excited about the opportunity to play against Brown and hopes that this will be the first of many scrimmages against college programs. If you are interested in playing against the WPLL, please contact Caitlin@prowomenslax.com.